EK Water Blocks releases the EK-FC1070 GTX Ti ASUS dedicated water block for several ASUS GeForce GTX 1070 Ti graphics cards. 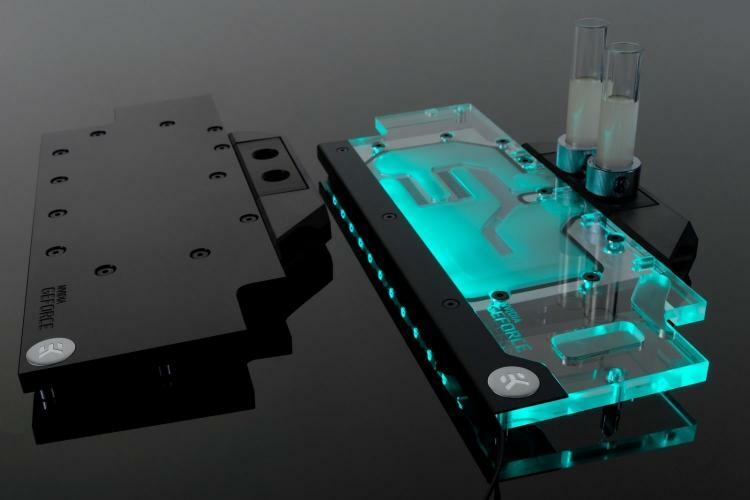 The water block offers high-performance cooling to the high-end graphics card for more stable and higher overclocks for gaming and GPU-intensive applications. The water block directly cools the critical areas of the graphics card including the GPU, VRAM, and VRM producing superior cooling performance over the stock air cooling solution. The EK-FC1070 GTX Ti ASUS water block sports a central inlet split-flow engine that works efficiently even with a reversed flow. The water block is made of nickel-plated electrolytic copper with two top options depending on the variant – either a high-quality acrylic material or a POM Acetal material. The EK-FC1070 GTX Ti ASUS RGB water block is compatible with popular RGB sync technologies from all major motherboard manufacturers since it features a classic 4-pin 12V RGB LED strip. The EK-FC1070 GTX Ti ASUS water block is compatible with the following ASUS GeForce GTX 1070 Ti graphics cards. The EK-FC1070 GTX Ti ASUS water blocks are now available for pre-order at the EK Webshop, shipping starts on May 21, 2018. Nickel variant gets an MSRP of 129.90€ while the Nickel+Acetal variant gets 115.90€.